The AS221-306 is a reflective SP4T Switch It is an ideal Switch for higher power applications. It CAN be used for GSM dual-band handset applications where low loss, low current, and small size are critical parameters. By Skyworks Solutions, Inc.
AS221-306 Pinout will be updated soon..., now you can download the pdf datasheet to check the pinouts ! 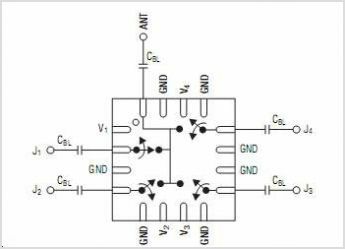 This is one application circuit of AS221-306,If you need more circuits,please download AS221-306's pdf datasheet.